The new Golf Channel competition series Altered Course begins on June 15, 2015. We told you a while back about Kristen Kenney, the host and play-by-play announcer for the show (view photos). And as a refresher about the show format, we'll quote from that earlier post: "Altered Course pits 2-person teams who must showcase their physical fitness as well as their golf prowess. They race against the clock while trying to beat other teams' golf scores, playing across multiple normal golf holes that have been combined into one monster hole." Yes, they are sisters! Golf Channel has assigned (or maybe the competitors came up with them themselves) hashtags for each team, and the Saviches are #SerbianSisters. Milena and Ariana were both born in Carmel, Ind., but their father is Serbian. 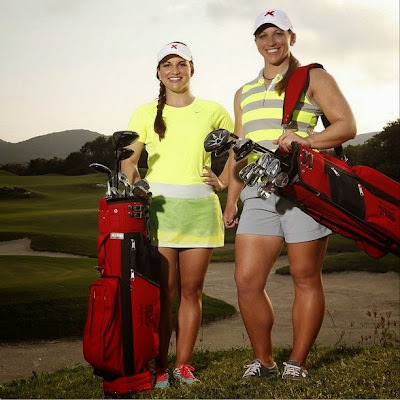 Milena is 25, Ariana 23; both are professional golfers: Milena plays on the Symetra Tour, but Ariana is currently working in the Communications department of the LPGA Tour. In college, Milena played for the University of Georgia and Ariana the University of Missouri. They have played together as a team before: they represented Serbia in the European Team Championships and the World Amateur Team Championships. "Can't believe they're putting us on TV together!" Ariana said on Instagram. I can believe it: If they didn't, Milena might have taken someone in a headlock with those impressive guns! Don't get her mad, guys. "I am SOOO THRILLED to announce that I am part of a new reality competition series called ALTERED COURSE on the Golf Channel!!" Jade posted on Facebook. "It will feature golf & fitness, and demonstrate mental toughness like you have NEVER seen before." The hashtag for Patipaksiri and Ek is #TheFrenemies. Why? They've known each other since they were children, which means they grew up trying to beat each other on the golf course. Then there was that time period when Amelia was dating one of Jada's brothers ... hey, it's complicated. Today they are friends and teammates. Jada, 24, plays on the Symetra Tour and on mini tours, but Amelia, 25, decided this year to move into the corporate world. Eileen and Kyla are the #CanadianNinjas. We don't know about the ninja part (you never do know about ninjas - until it's too late, eh? ), but they are definitely Canadian! British Columbian, to be more exact. Kyla, 28, and Eileen, 27, were college teammates at the University of British Columbia. Eileen turned pro for Altered Course and is playing minitours in 2015. Kyla is the more experienced pro, and is playing the Symetra Tour in 2015. For more details about the show, its format and the other teams, see the Golf Channel's Altered Course microsite.